From the classroom to the conference room, engage your audience with vibrant presentations and dramatic 3D content* on the affordable 1420X Projector. Bright and versatile: This bright projector lets you deliver dynamic presentations in a variety of lighting conditions with 2700 ANSI Lumens (max). Crisp, clear projection: Engage your audience with bold 3D graphics*, vibrant color, crisp text and XGA resolution. Easy to operate: Conveniently connect to multiple devices and enjoy long lamp life. Count on the outstanding brightness and picture quality of the 1420X Projector, whether you’re presenting to a conference room full of professionals or a classroom of students. Enjoy bright, versatile projection: Your presentations will appear bright and bold in a variety of lighting conditions with 2700 ANSI Lumens (max). Go bold with affordable 3D capability*: Project dramatic 3D content via your computer. 3D imagery can help keep your audience immersed in the message, and you can stay on budget. Experience excellent image quality: Vibrant color, clear imagery and crisp text are yours with features such as XGA resolution (1024 x 768), a high contrast ratio of 2400:1 and BrilliantColorTM technology. 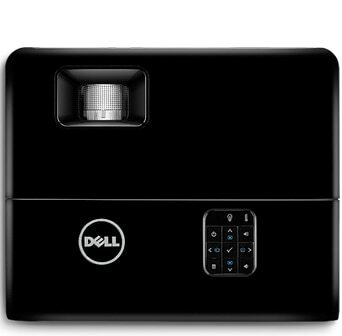 Present effectively and easily with the reliable DellTM 1420X Projector. It was designed specifically for ease of use and dependability. Dependable projection relies on long lamp life. That’s exactly what the 1420X Projector offers— up to 4,500 hours* in Normal Mode and up to 6,000 hours* in Eco-Mode. Connect to multimedia devices or switch from one presenter to another with a range of connectivity options including Dual VGA-In, S-Video, and Composite Video. Easily reduce your projector shutdown time with a single press of the power on/off button (prior setup required). Discover an economical and reliable solution. 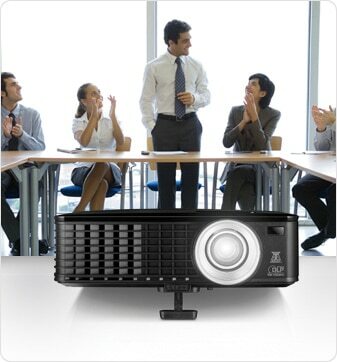 When it comes to planning for effective presentations day in and day out, count on a reliable projection solution and low total cost of ownership with the 1420X Projector. Streamlined maintenance: Top-load access makes changing the 1420X lamp easy, even while the projector is still attached to a ceiling mount (ceiling mount kit sold separately). The filter-free design helps ensure simple maintenance. Enduring value: The DellTM 1420X offers an impressive value for your organization with its reliability, versatility, ease-of-use, long lamp life and low total cost of ownership. Key security features: Keep your projector safe. Password protection helps guard against unauthorized use and the Kensington lock slot helps protect against theft (security cable sold separately).